What a great idea! I have so many scraps laying around. Now I know what to do with them. Thanks! That is a great idea! Thanks for sharing! aww these are cute! i must try these! Cute! Gee, I just made some new pretty scraps. Alas, I don't have stiffener or a glue gun. Really cute! I'm happy to know about fabric stiffener too! You are so stinkin' creative! These are fun! ohhhhmygoodness, these are just stupid adorable. Such a great idea, thanks for sharing! Que lindos! Obrigada por compartilhar com o mundo! You and the fabric stiffener - what next?? I love it. Gorgeous - I have two little girls who LOVE hair accessories....brilliant idea. Thanks for sharing. Oh I just LOVE them! I think I have to make some. What an adorable idea! I can't wait to make some. Super cute! What a great idea!! Thank you so much for sharing!! Okay...these are BEYOND fabulous. I am in love, and my head is SPINNING with the possibilities. My head is also trying not to laugh at the word "stiffener", but I'm pretty sure I'll blame that on the influence of my husbands immature sense of humor. My fabric scraps and I are sending you our RESOUNDING thank you! And We can't wait to get started. Cute, cute, and more Cute!! What an excellent idea! I'll have to tell my fellow crafter who is still looking for ideas for a Mother's Day stall. C'est une super idée !!! SO CUTE AND SO GIRLY!!! I love them. 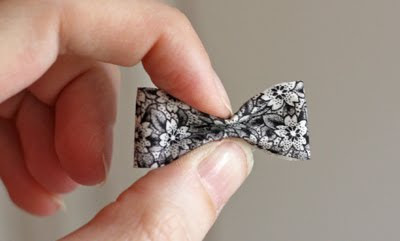 Tying a bow is an art form! such a cute paper clip! my cats would be on these in a second. I'd be losing my place in whatever book I'm reading. thanks for the tutorial! What a sweet idea! 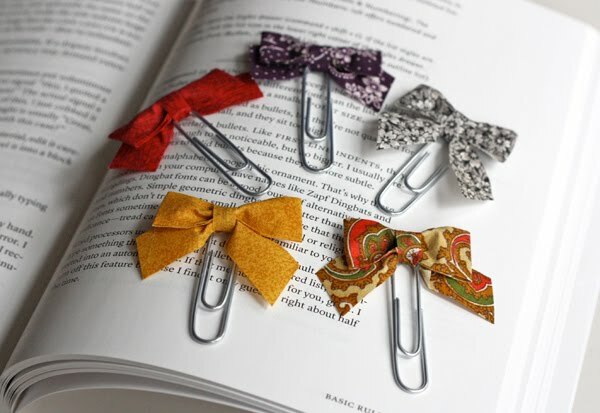 My 4 year old looked at them and proclaimed them, "so cute little bows." Oh! These are adorable. But please don't use them as bookmarks! If you'd like to damage your own books, I guess you could go for it. Just don't use these in library books or you just might end up paying for the damages. I know that might seem silly, but they can really damage a book. Oh my gosh-YES! My nightly reading time is my favorite time of the day. Incorporating favorite fabrics can only make it better. Thanks so much for this one- I'll be spreading the word. Jessica- I've been caught! I do work in a library. And recently spent a good amount of time pulling paper clips out of a book. The patron was charged the replacement fee for the item. It was pretty mangled from all the bending. But again- feel free to use them on your own books! I really do like them a lot! This is the cutest idea! Thank you so much for posting the tutorial. I love that it gives me a way to use my scraps and I get cute new bookmarks at the same time. Awesome! You know what I like best about the bows? That you used the Constitution in the photo. :) I can't wait to get home and make some of these! Ah ha! Chelsie, I knew it! 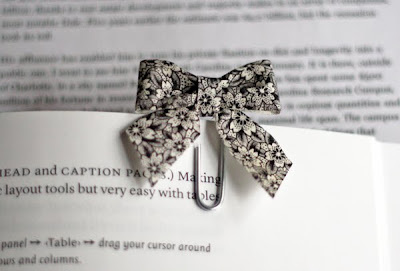 :) You'll be relieved to know that I'm way too impatient to use paper clips as bookmarks anyhow. 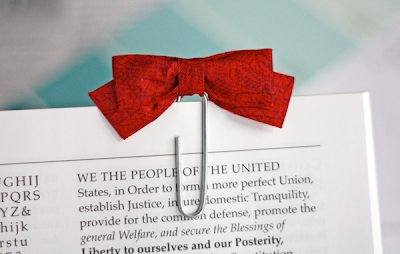 Trying to feed the page into the paper clip slot is 3 seconds of my life I'll never get back. I'd rather fold the corner of the page over. JUST KIDDING! I usually use a scrap of junk mail, a kleenex, or a brand new set of actual bookmarks I just got from a friend. 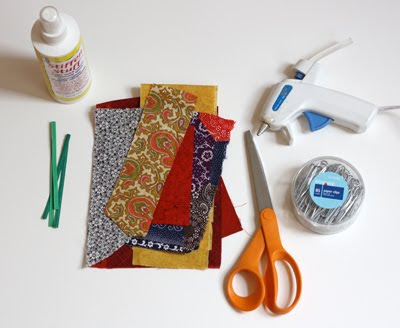 This is such a great way to use fabric scraps. Soo adorable, I love it! i made one last night and ditched my boring bookmark! i didn't have stiffener so i made it without it anyway, and it turned out soooo cute! it was quick, easy...instant gratification:) thanks for sharing! Oh, my goodness, these are SO CUTE! They are really really really cute! What a cute and creative idea! thanks for the awesome idea, it was so easy too! Thank you for the excellent posts! You do amazing work. Thank you very much for sharing.